Coffee, as far as we’re concerned, makes the world go round. If someone nearby isn’t brewing up a good cup of java, then something is seriously wrong. 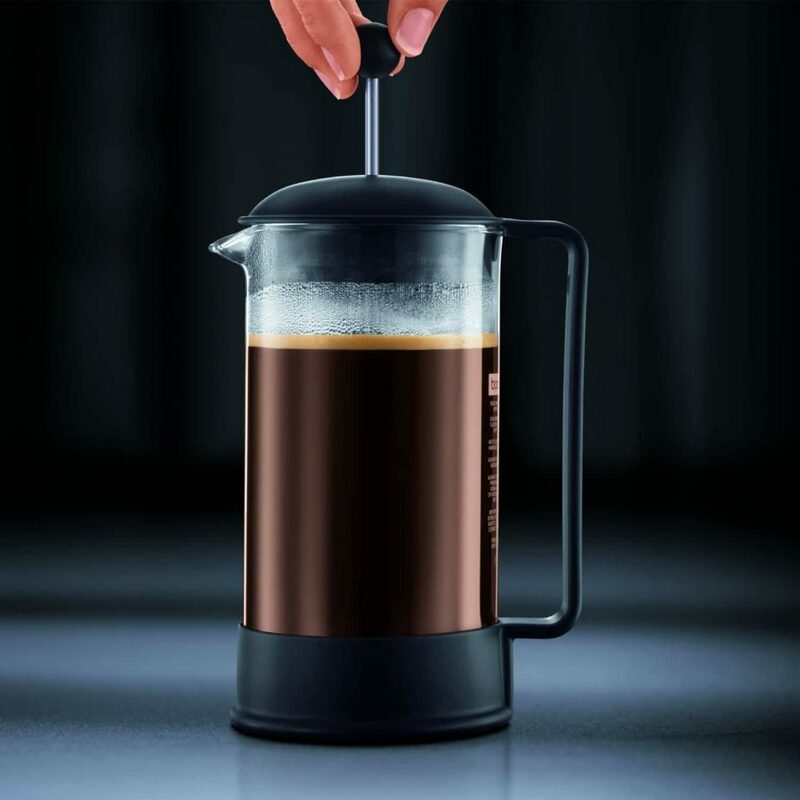 Known for its super smooth brew, and full-bodied flavor, a French press provides a simple way of creating the perfect coffee. 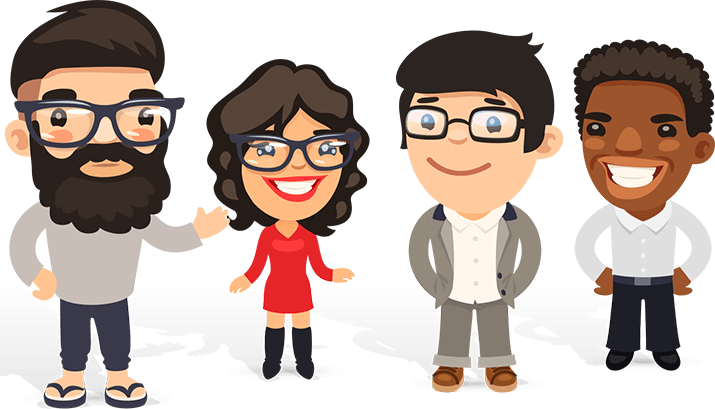 So, how can you get the very best out of your press? 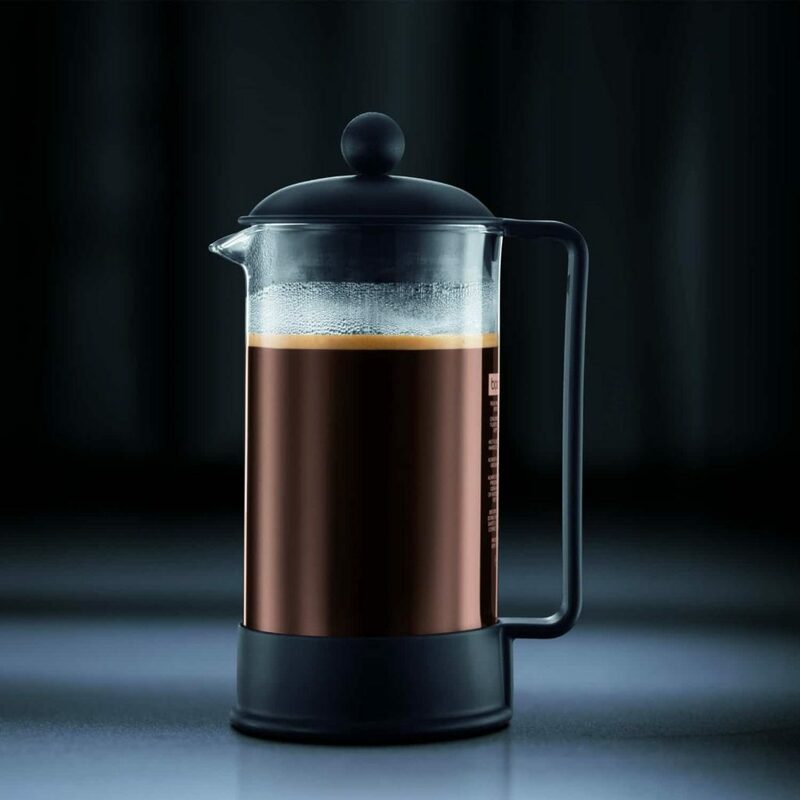 A French press is an immersion brewing technique; that is, you put the grounds in the jug and add water then let it sit. 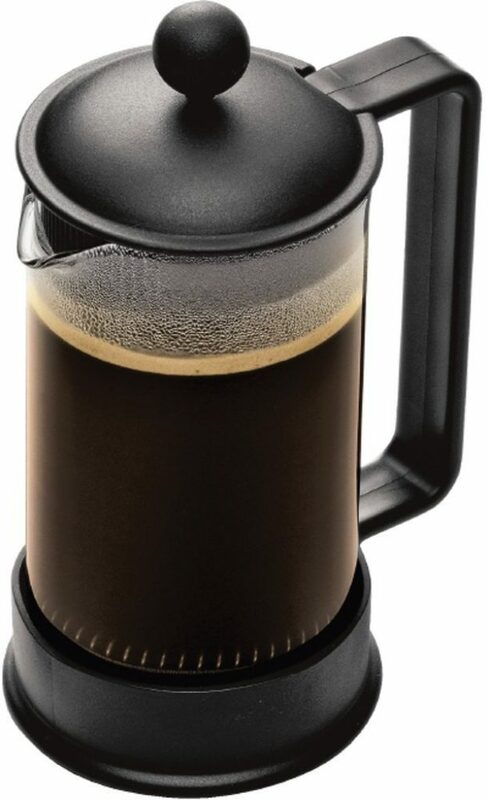 After a few minutes, using a plunger, you push the ground coffee to the base of the jug and hold it there. 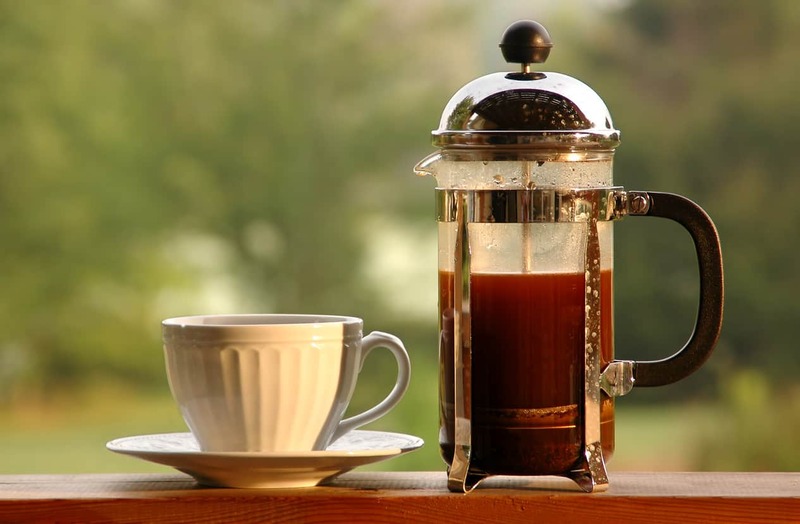 There are three main components of a French press – the carafe, plunger and lid. 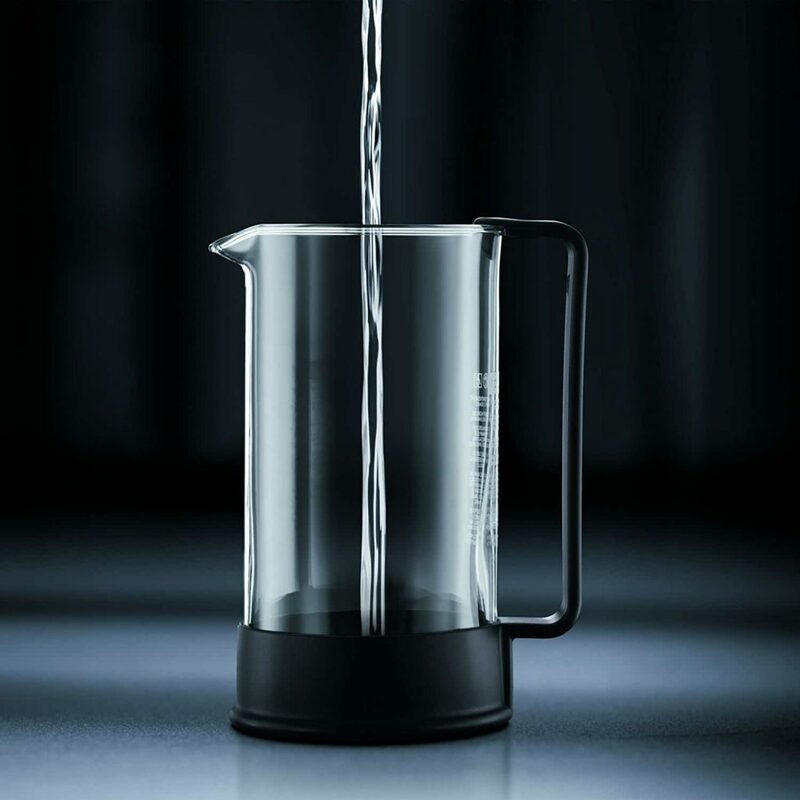 The carafe holds the coffee, having a spout to pour out once it’s brewed. They are made of various materials. 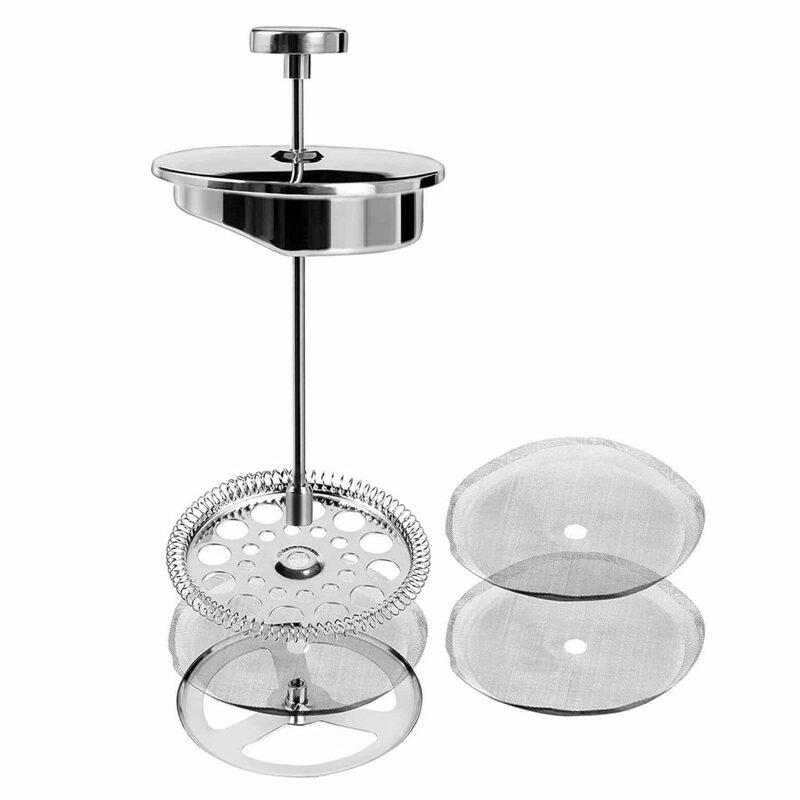 The plunger contains the filter – this is what plunges down on the coffee grounds and separates them from the hot water, and as a result is a crucial component in the French press. It’s important to think about the best material for your filter’s composition. 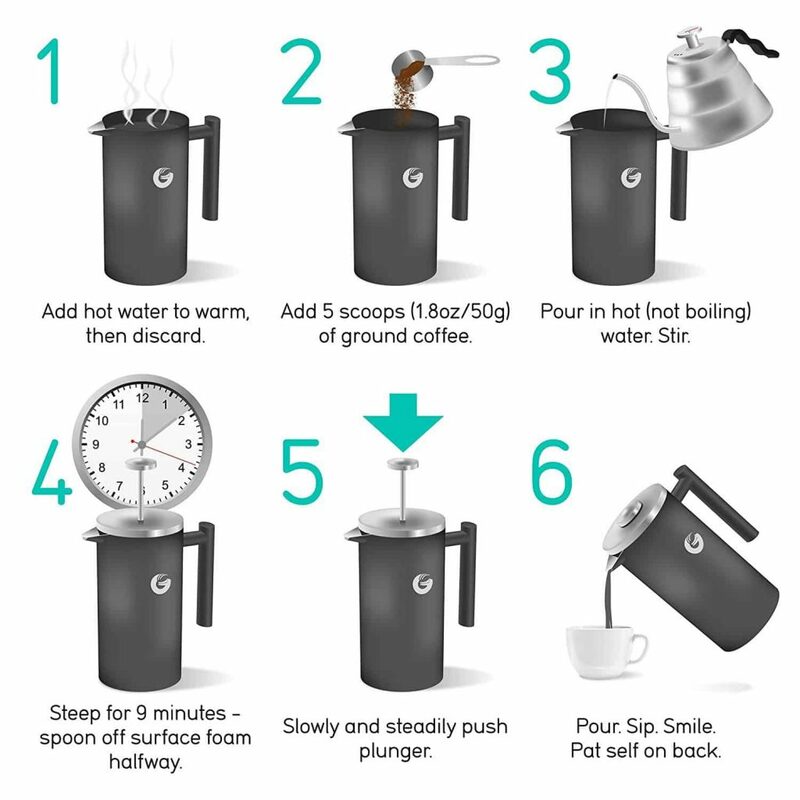 If the filter has plastic or rubber around the edge, this may well break down with usage, allowing the grounds to get through and end up in your cup. In contrast, metal won’t degrade and will be effective forever. 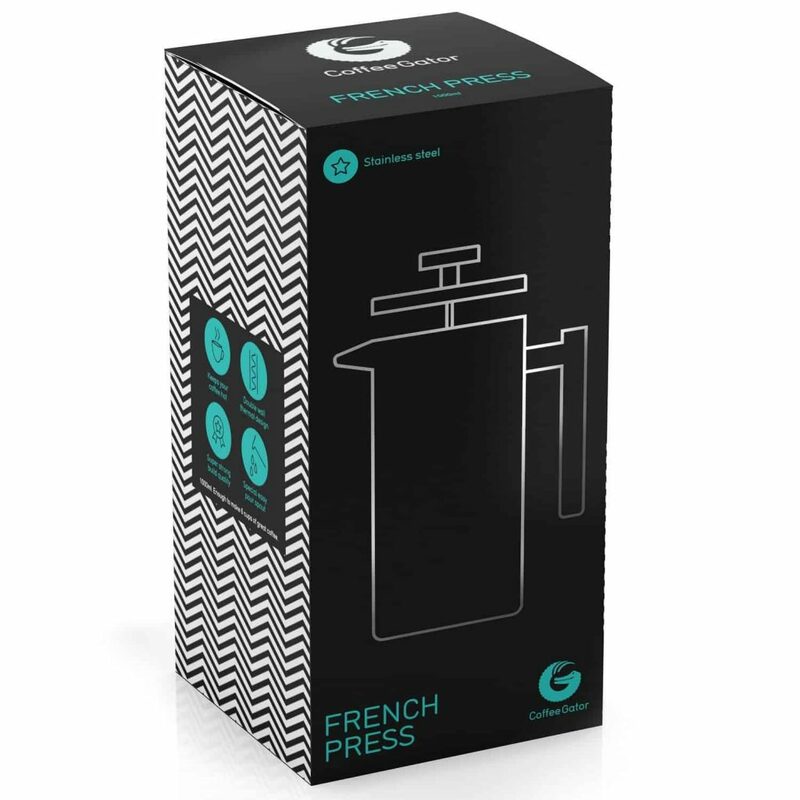 French presses come in a variety of sizes, so if you want your coffee to be at its freshest, and therefore best, it’s a good idea to have several sizes in the cupboard. They can range from a single cup size right up to 48oz, perfect for a social occasion. 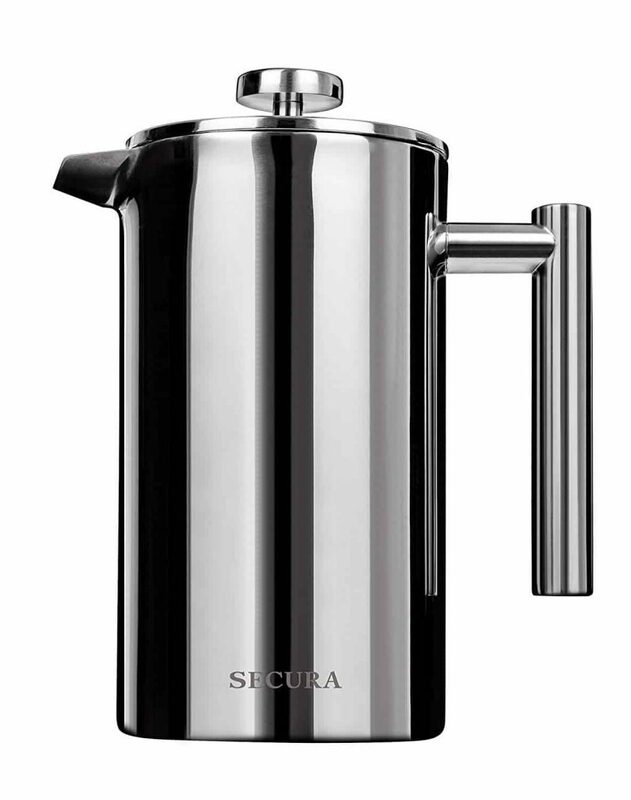 This stylishly sleek French press would suit any kitchen, looking stylish on your countertop. 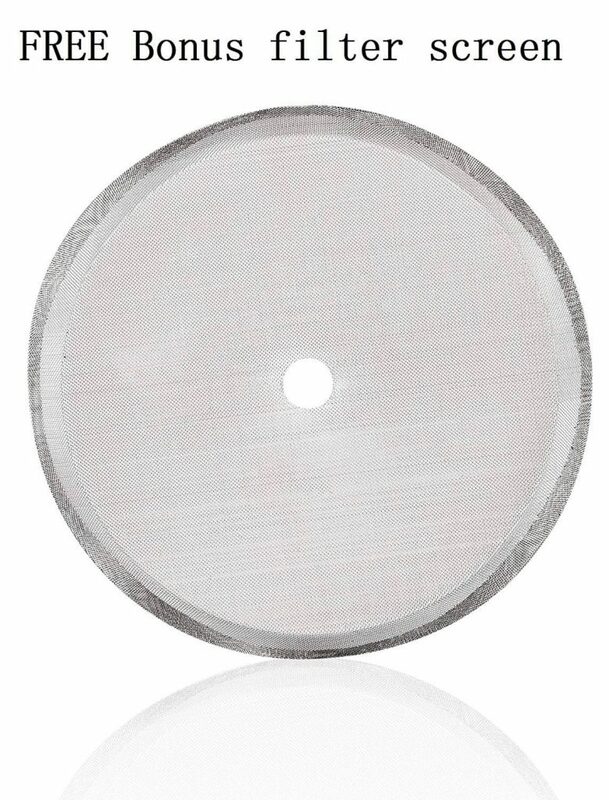 Every part of this product is stainless steel, even the collar around the plunger. We had the perfect brew from this, and it retained its heat for nearly three hours thanks to the insulated carafe. 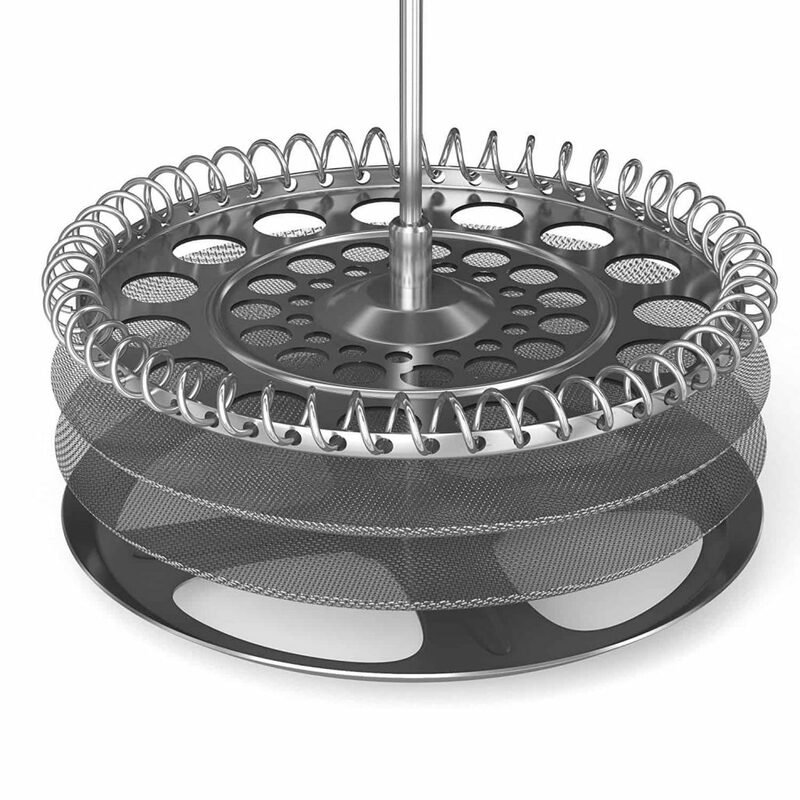 The 3-ply filter meant nothing contaminated our coffee – it was smooth and completely clear. 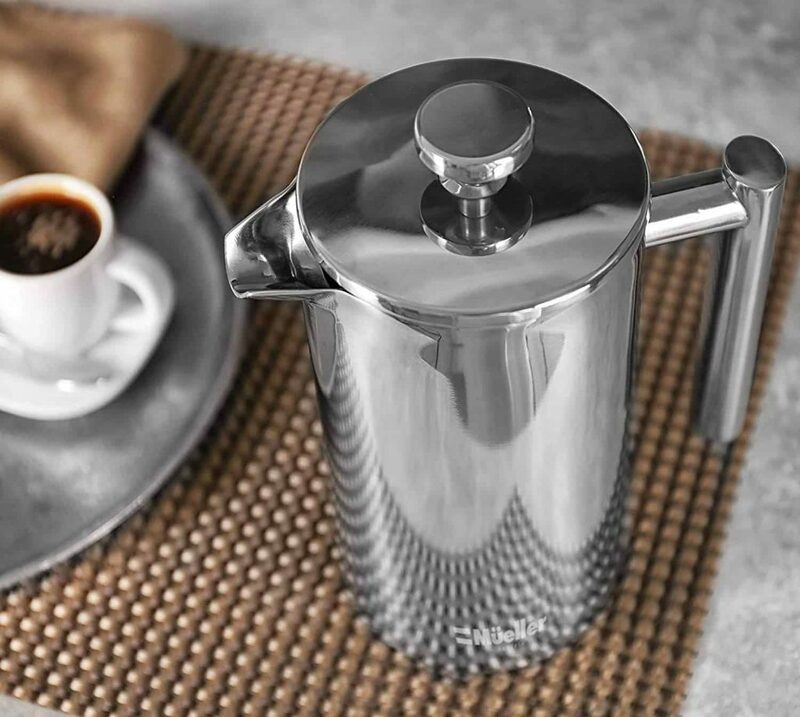 This French Press is made from the highest quality stainless steel and there is a cool touch handle to avoid you burning yourself. It’s also dishwasher safe for easy cleaning. It’s great that extra filters are included. We really can’t find a negative with this. It’s stylish and works like a dream. 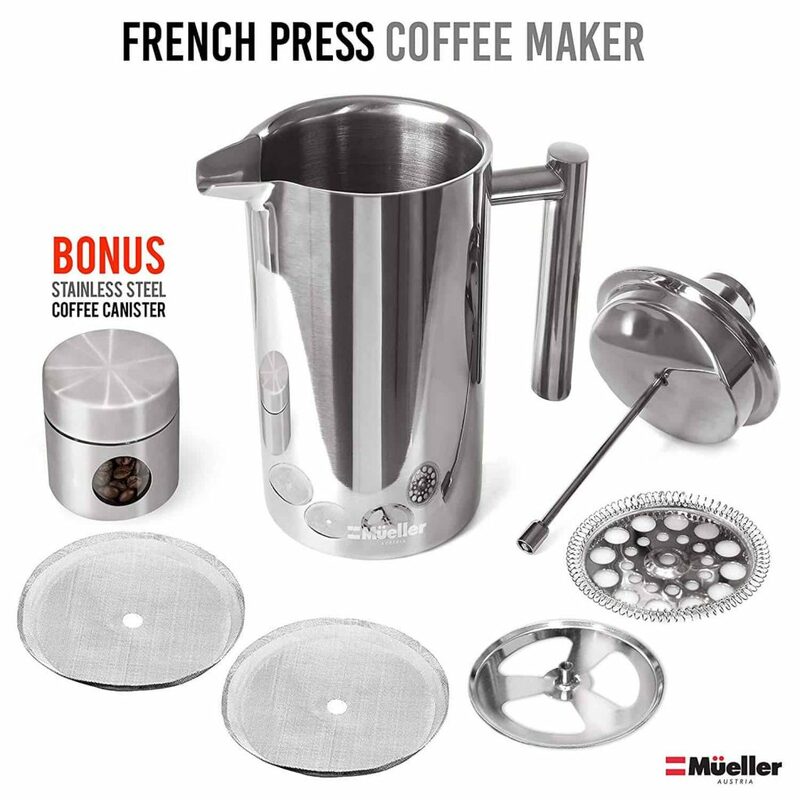 A professional, durable press, with ultra-fine filters, that made a perfect coffee. Happy to recommend. 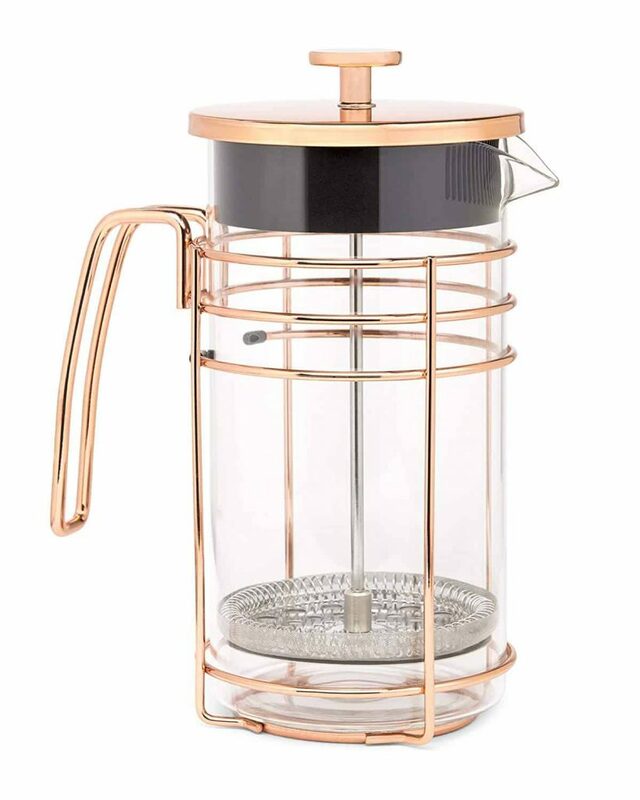 This French press in trendy rose gold is gorgeous – with curves in just the right places. 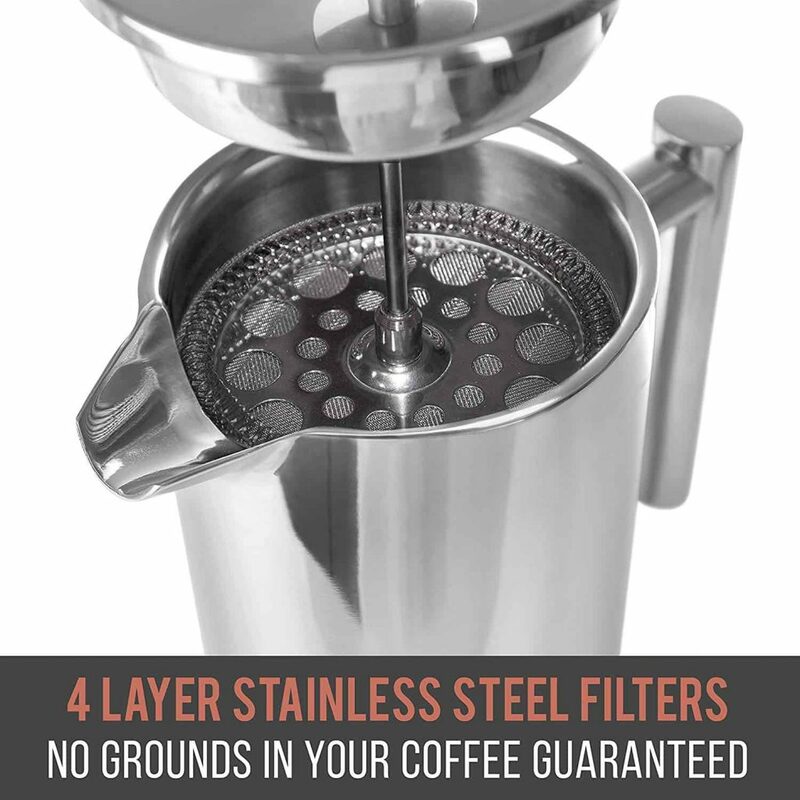 The glass carafe fits snuggly inside the stainless steel sleeve, and the four layer filter is impressive. We all love the look of the slightly art deco-esque design – it seems to echo old style Hollywood glamour. Every part fits together so well, and while the four-layer filter may be slight overkill, there is no doubting the smoothness of the ensuing coffee. 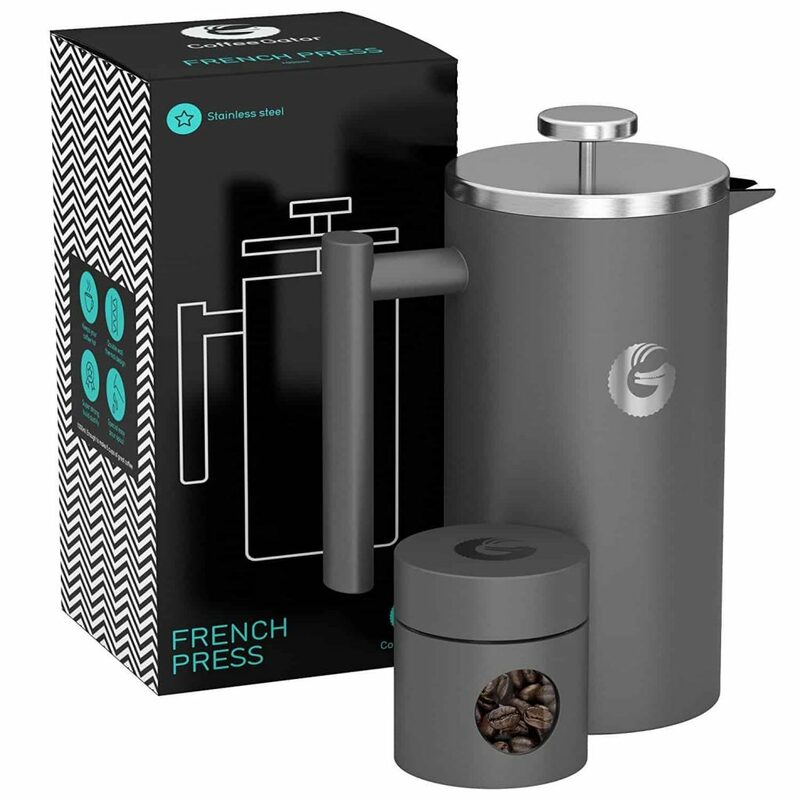 In terms of features, this fantastic French Press is BPA free (non toxic! 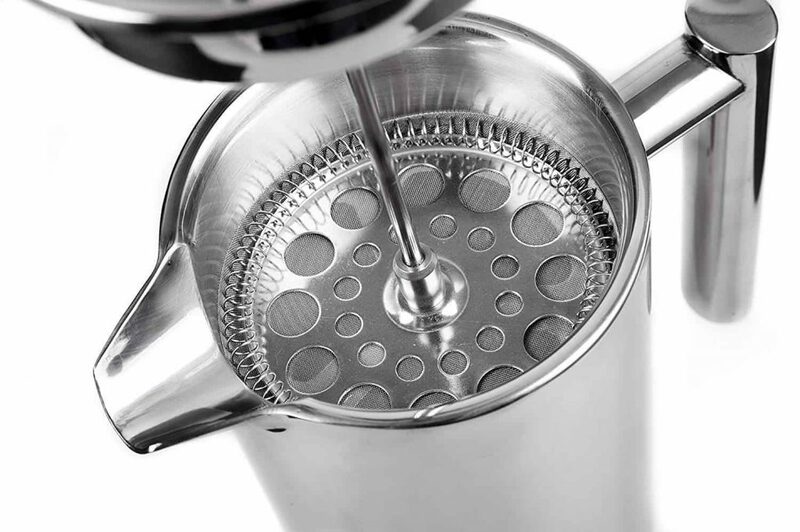 ), comes with a 3 x layer filtration system for even tastier coffee and is made from stainless steel. It’s dishwasher safe. 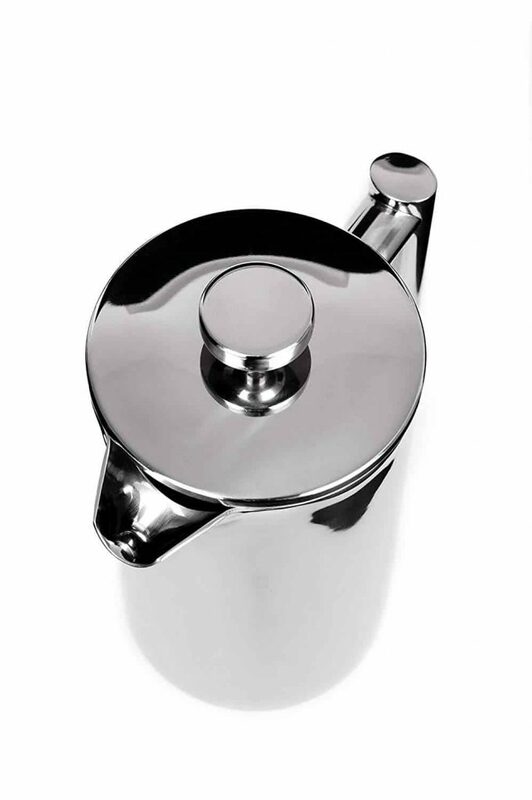 Because of its design, this French Press feels different to a conventional model. It takes a little getting used to and may feel flimsy, but be assured, it will last. A unique and interesting design, brews clear and clean tasting coffee. 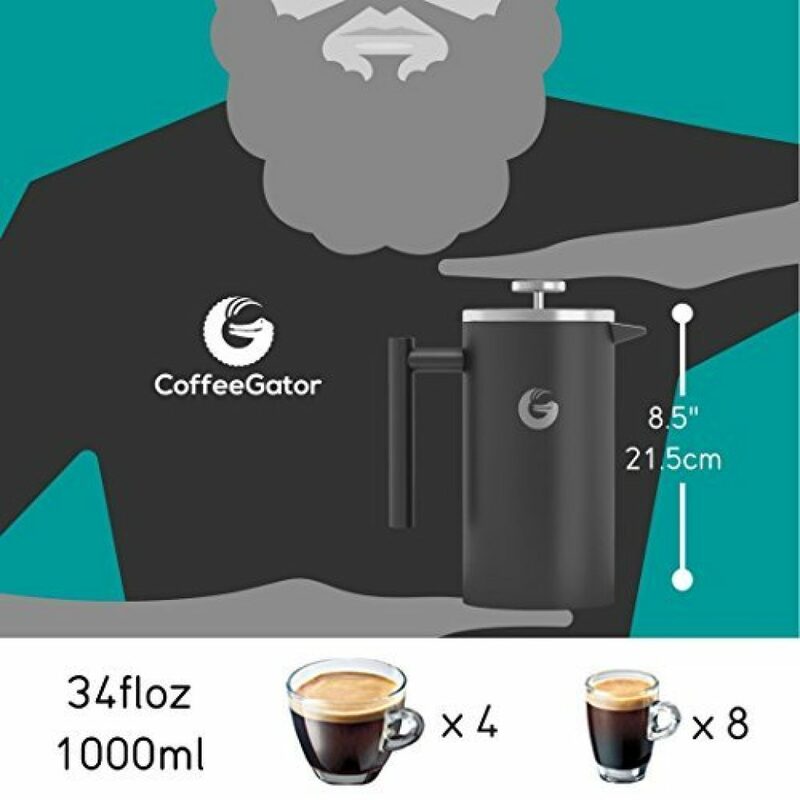 It makes a great gift for a coffee lover. 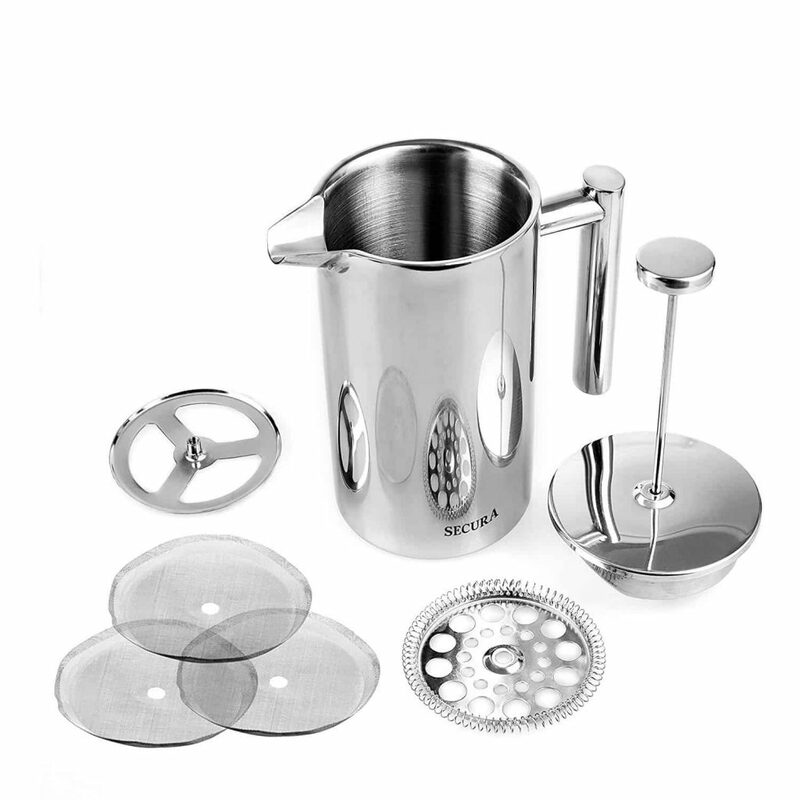 Most of us have owned similar Bodum presses before, and like those, this is plain, simple and well made. 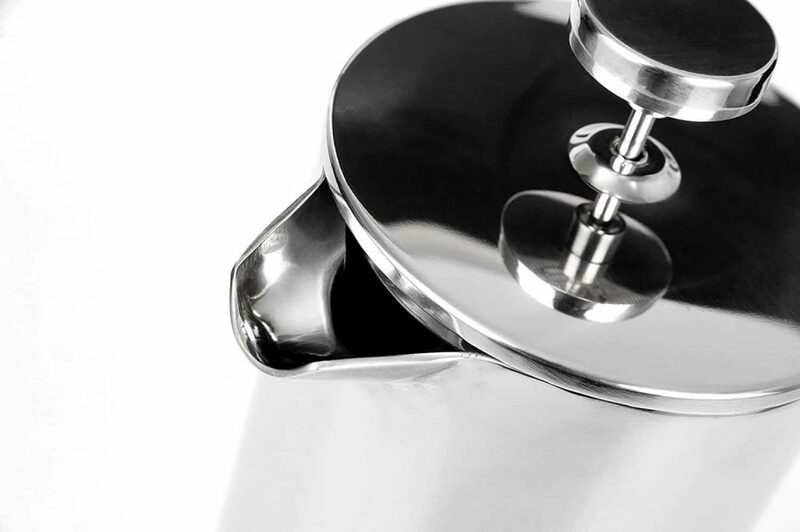 This press proves that you don’t need either chic or expensive to make a decent cup of Joe. This is reliable, functional, and works well. The simple design just needs coffee and water to look perfect. 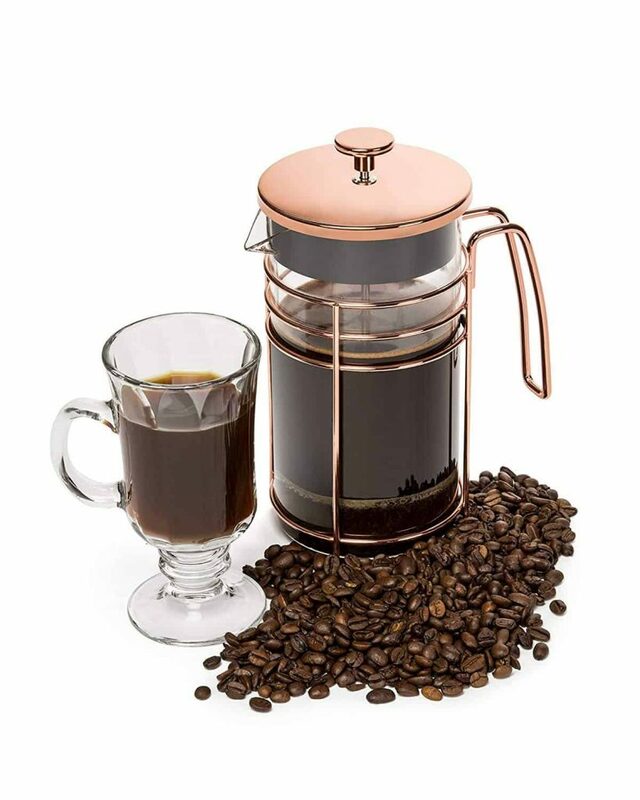 This French Press is also BPA free, and the glass carafe is made from borosilicate glass, which is highly durable. It’s dishwasher safe for convenience. 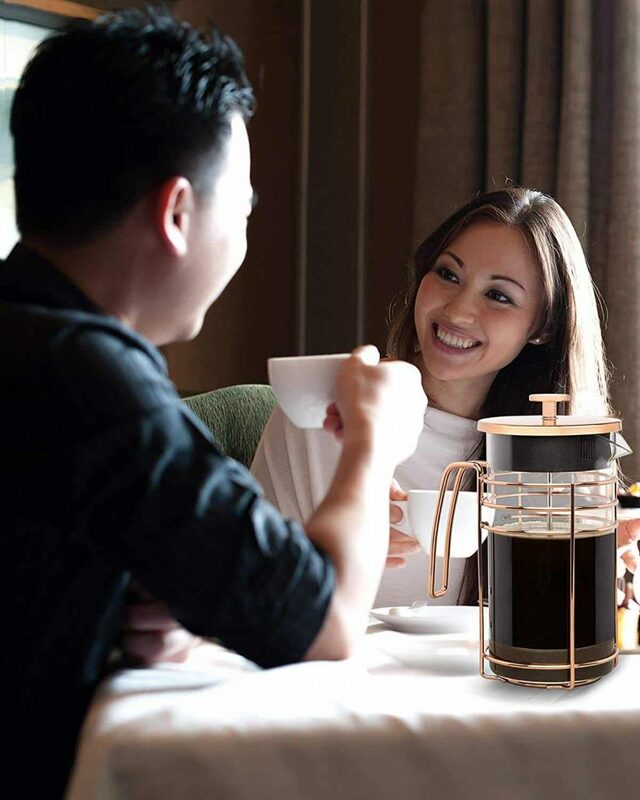 The capacity is 3 large cups of coffee, which is perfect for a small household or for work. But if you’re living in a busy house, you may need 2 x of them! 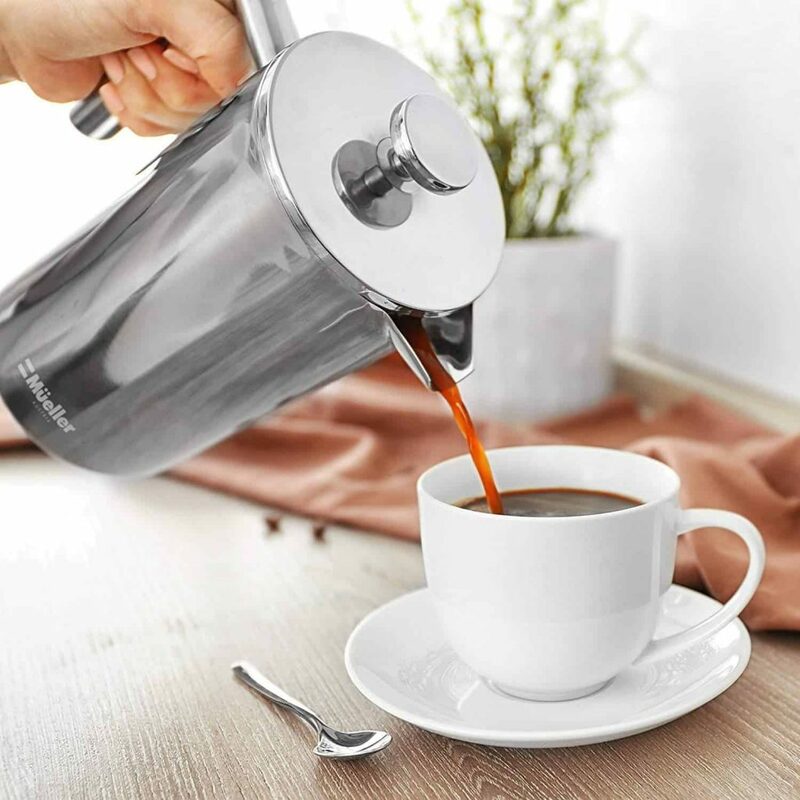 Bodum have kept to a design that works and works well. The coffee tastes great, it’s simple to use, and the price is good enough to have one at home and at work. This is a great looking press; it feels so solid and slightly heavier than the others we tried. It comes in several colors, including orange and purple, and different sizes too. The coffee canister is a nice touch. The vacuum layer that this product has kept our coffee steaming hot for nearly three hours, and with the double filtration, there wasn’t a single ground in our cup. It brews a great coffee and pours like a dream. 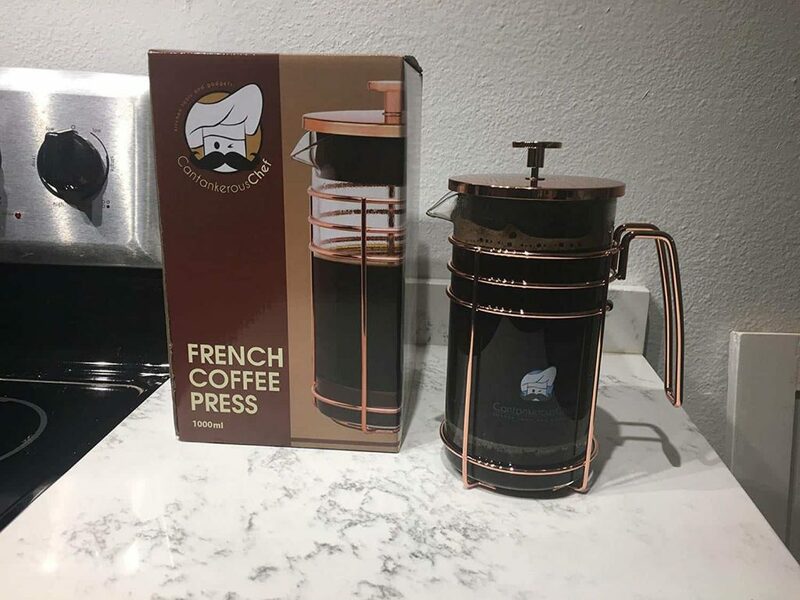 It’s in the upper price bracket for French presses, which may make it less affordable for some people, but if you want something trendy – it’s well worth the cash. This upholds Coffee Gator’s reputation for knowing how to make great coffee, and even with the price tag, this is an awesome press. 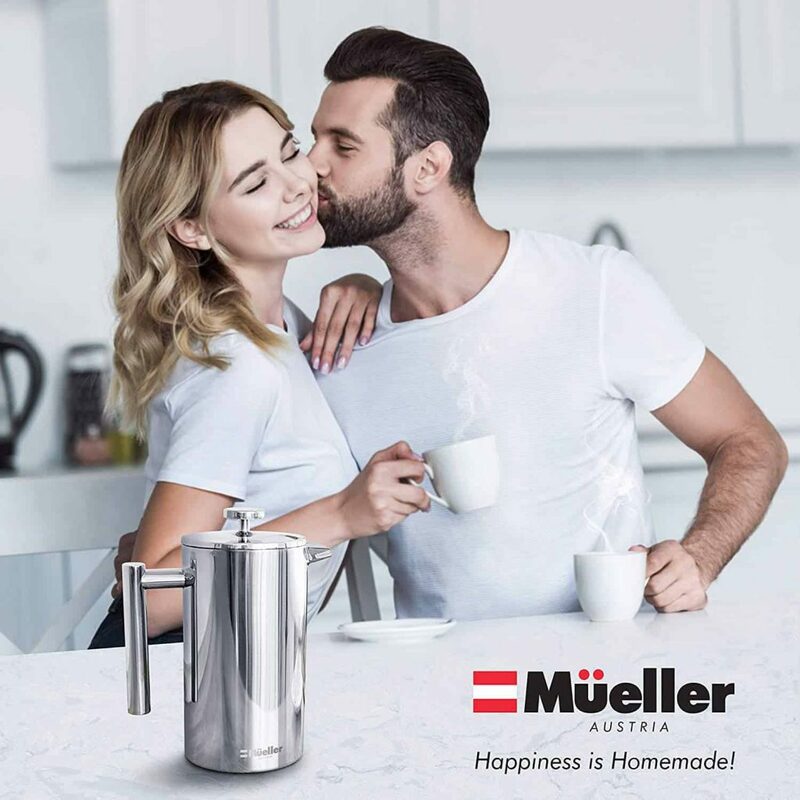 This is an incredibly stylish coffee maker, with a good, solid base – no chance of it being knocked over. 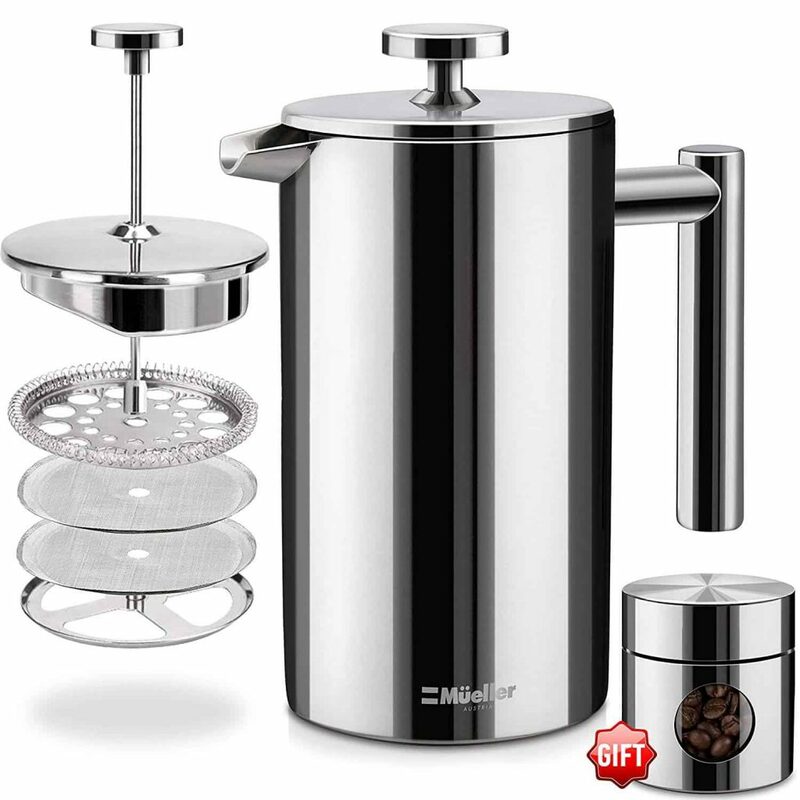 It feels very solidly made with double walled stainless steel, and is a decent size. This press not only looks good but performs well too. With the quality triple layered filter, there’s no way any rogue grounds are sneaking through, and our coffee was grit free and delicious. It remained warm for ages, and the taste stayed fresh. The huge capacity is perfect even for a family. 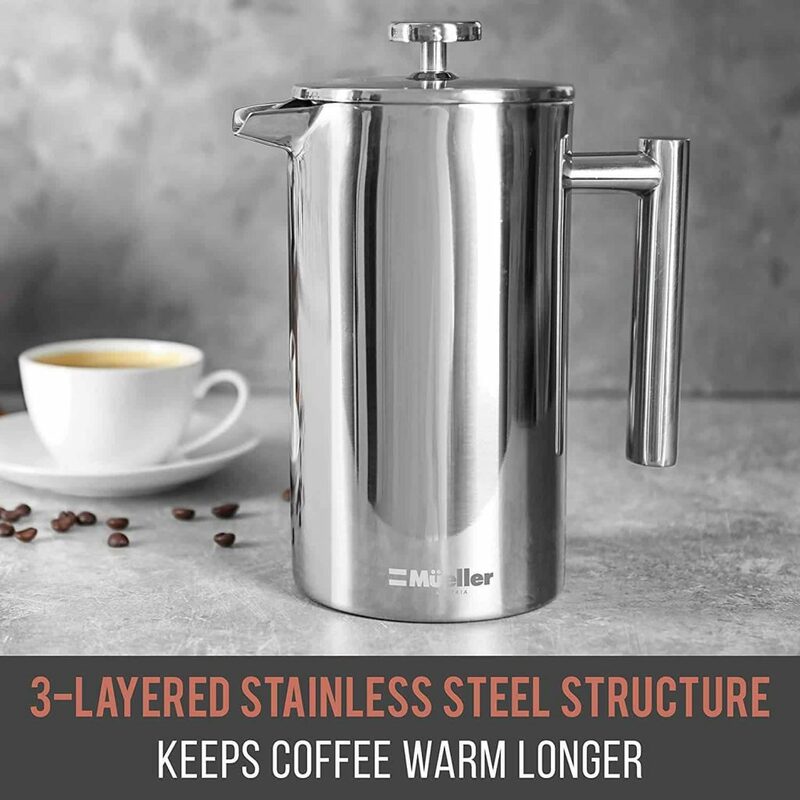 We liked the double stainless steel walls that keep coffee warm for hours, and double encapsulated lid, making this press feel extra hard wearing. 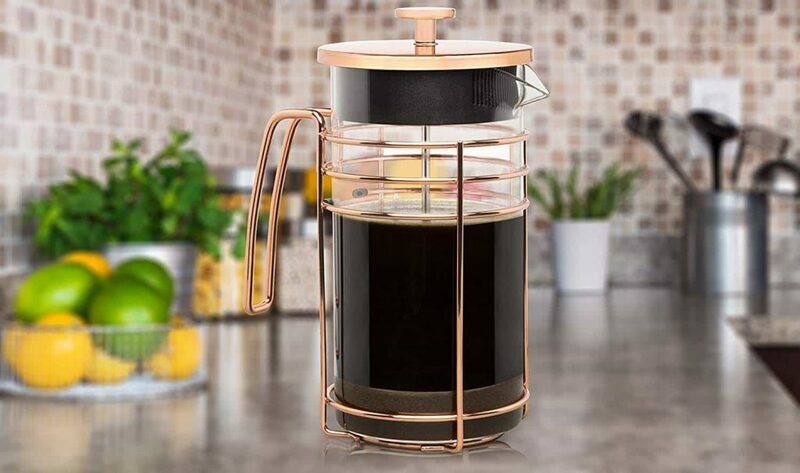 We couldn’t find anything wrong with this French Press. It works like a charm. If you love good java, and enjoy the luxury look without the luxury prices, this one could be for you. Happy to recommend. 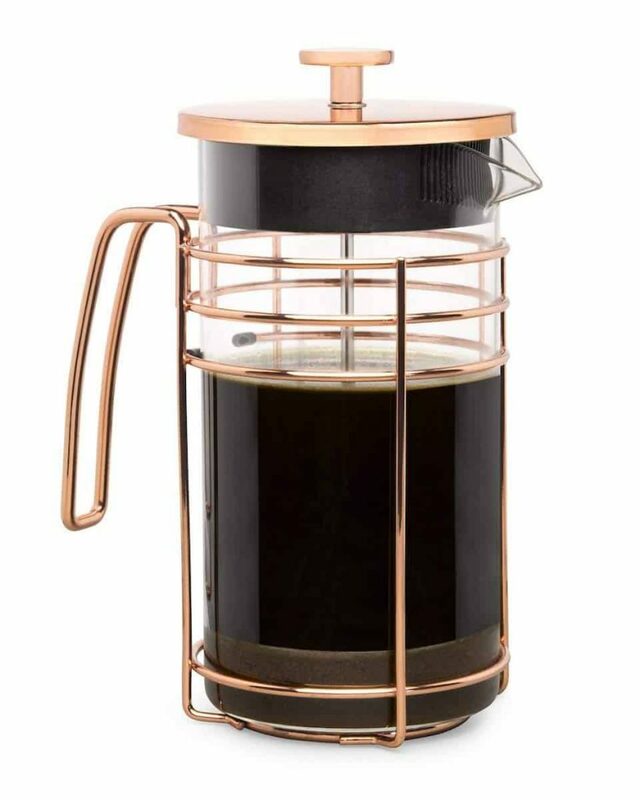 ☕ IF YOU REALLY CARE ABOUT YOUR COFFEE - We tested enough mechanisms and filters to make your head spin to tweak and uniquely design our press with a triple layered filter structure to stop the sediment, but let the yummy coffee oils through for a full-bodied delicious brew that will make you a very happy camper. And to share the java love, we give you a bonus matching travel canister that holds enough beans or grounds for two full batches.